People exert large amounts of problem-solving effort playing computer games. Simple image- and text-recognition tasks have been successfully "crowd-sourced" through games, but it is not clear if more complex scientific problems can be solved with human-directed computing. Protein structure prediction is one such problem: locating the biologically relevant native conformation of a protein is a formidable computational challenge given the very large size of the search space. Here we describe Foldit, a multiplayer online game that engages non-scientists in solving hard prediction problems. Foldit players interact with protein structures using direct manipulation tools and user-friendly versions of algorithms from the Rosetta structure prediction methodology, while they compete and collaborate to optimize the computed energy. We show that top-ranked Foldit players excel at solving challenging structure refinement problems in which substantial backbone rearrangements are necessary to achieve the burial of hydrophobic residues. Players working collaboratively develop a rich assortment of new strategies and algorithms; unlike computational approaches, they explore not only the conformational space but also the space of possible search strategies. 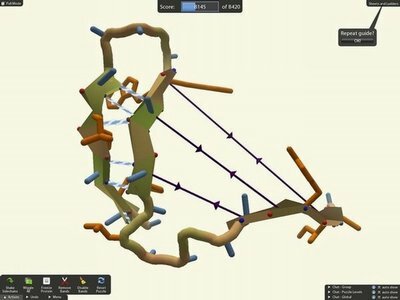 The integration of human visual problem-solving and strategy development capabilities with traditional computational algorithms through interactive multiplayer games is a powerful new approach to solving computationally-limited scientific problems.